I know a lot of you have cats like we do. I actually can’t believe how long Scully has been a part of the family. I found her at the SPCA almost 10 years ago the month after I graduated from college. Rivey came several years later when one of Stephen’s coworkers found a litter of kittens in the barn behind her house. I never saw myself as someone with a multi-pet household, it just sort of happened. At our old house, all the cat stuff was relegated to the basement space. It could be smelly down there because we only bolted down to do quick loads of laundry or to grab things from the upright freezer. Now that we live in a house with a fabulous, mostly finished basement, we’re spending a lot more time in the cats’ domain. And, guys, it smells sometimes. I fixate on it. Over the past eight or so months since we moved, we have tried basically every cat litter known to man to tame our odor problem. The issues we’ve faced? Ones that don’t clump enough, ones that don’t absorb odors, many others that mask odors with awfully artificial scents (which -- to me -- is so much worse than cat smell). The list goes on. So, when BlogHer offered up a chance to try Cat’s Pride® Fresh & Light® Ultimate Care™, I was both desperate and intrigued. Up to this point, we hadn’t tried any of the light litters on the market. Honestly, I had assumed they might not work as well because, uh, they’re light. It sounded like a gimmick to me. Like attention put in the wrong area, because with multi-cat households, it’s all about the stink. On top of that, I was really hoping to find an unscented alternative that controlled odors with gusto, and Cat’s Pride boasts a 10-day odor control guarantee. 1.) Ultimate Care is different from other lightweight litters because it doesn’t use fillers (paper, wood chips, light density rock, etc.). Instead, it’s made entirely of high absorbing clay, the same kind used to filter impurities out of cooking oils and absorb moisture from major league baseball fields. Pretty neat, huh? And it’s 99.9% dust free, which I noticed right away when pouring it into the box. 3.) On top of all this good stuff, the clumps are mega-tight. I hate cleaning the litter box, but when it isn’t as messy a job, it’s much more bearable. The cats appreciate this as well (and I like that the clean litter stays clean so I don’t feel like I’m wasting it all). 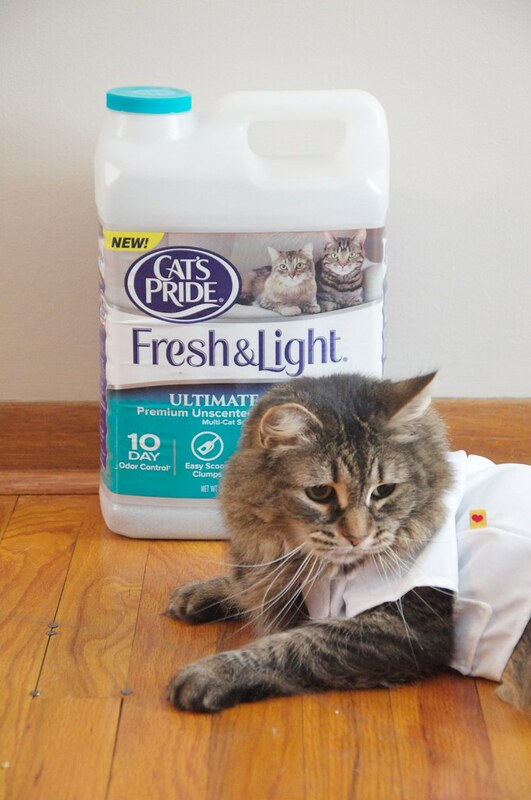 Have you guys tried Cat’s Pride Fresh & Light Ultimate Care? Do you have any tips for sharing space with cats? Be sure to visit Cat’s Pride brand page on BlogHer.com where you can read other bloggers’ posts!